On July 25, 2011, at approximately 7:45 PM, Yavapai County Sheriff’s Office deputies responded to the 5400 block of Onyx Drive, Prescott, regarding a reported missing 10-year-old male. Bill Gunn, the child’s father, told dispatchers his son Dakota had been missing for about an hour. Rescues performed on July 16 and July 25, 2011 in the mountainous region between Lake Pleasant and Crown King. A common denominator in these rescues was a working cell phone. On Monday, May 30, 2011, 20-year-old Cate McCabe from Paulden was reported missing to the Yavapai County Sheriff’s Office. Deputies were told that Cate had gone out with her boyfriend on Friday, May 27, 2011, and had not been seen or heard from since. On Saturday, Cate’s boyfriend returned to the area but was unclear to her family where Cate could be found. Over the weekend, Cate’s family contacted various hospitals in the area thinking she could have been injured in an accident. Cate was not located. On May 10, 2011, at approximately 10 A.M., Yavapai County Sheriff’s Office deputies responded to a reported injured quad rider in the Table Mesa area. The caller told dispatchers via cell phone that her husband, 51-year-old Jon Provost, had suffered injuries after his quad rolled and landed on top of him while trying to negotiate a large rock. On April 25, 2011, around 1 PM, the Yavapai County Sheriff’s Office was contacted by a Mr. Greg Cain who reported that his 41-year-old wife, Amber, and 8-year-old son, Nathan, were missing. The family had been camping on Mingus Mountain near Forest Road 413. Greg indicated he had last seen them about 2 hours prior. He searched the area before calling, but could not locate either his wife or child. 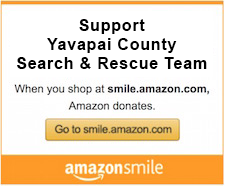 The following is a summary of search and rescue activity conducted by Yavapai County Sheriff’s Office deputies assigned to Forest Patrol, along with volunteers from the Yavapai County Sheriff’s Response Team (YCSRT) and Jeep Posse. Last month, the Yavapai County Sheriff’s Office Backcountry Unit was honored to receive a $4,000 dollar grant from the Yavapai County Community Foundation. The Backcountry Unit is one of several invaluable rescue groups who are part of the Yavapai County Sheriff’s Office Response Team (YCSRT) and serve as a mountain rescue team for the county. The Backcountry Unit has extensive training in tracking, field searches, swift water rescue, helicopter operations, and is frequently utilized by the Sheriff’s Office as a first response team.